Sri Lanka, a land which posses picturesque tea gardens in different regions, bearing a variety of soil and climatic conditions giving all its teas world renowned unique tastes and characteristics. Ceylon tea is versatile and is of the highest quality. 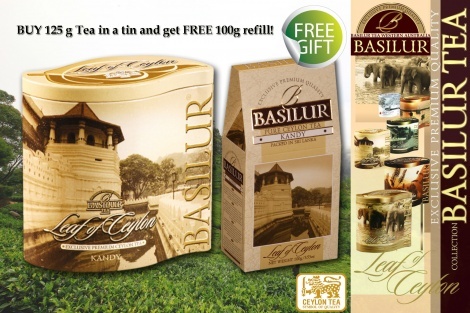 Basilur, an equally versatile brand of tea with its cutting edge technology stands out in providing unique state of the art designed packaging and Ceylon's finest teas at its best. Leaf of Ceylon range is a concept which was designed to educate our valued consumers the distinctive differences of regions in Sri Lanka where tea is grown. 125g and 100g loose leaf tea packed in flavour-sealed foil pouches with zipper lock into uniquely designed metal tin caddies and carton packets.